SR-22 - Tiftickjian Law Firm, P.C. An SR-22 is a rider to an insurance policy in which the insurance company guarantees that you will keep insurance in effect for a certain period of time. In order to get your license back after having certain suspensions or revocations or to keep from getting your license suspended you may have to file the SR-22. When you purchase liability insurance, the insurance agent can provide the SR-22 form. When the insurance policy with the SR-22 rider is purchased, the form is filed with the Colorado Division of Motor Vehicles. The form is not an insurance policy. 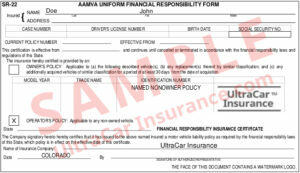 The form is a guarantee by the insurance company that you will keep the insurance in effect for a certain period. If you don’t keep the SR-22 current, the insurance company will notify the Motor Vehicle Division. Once the Motor Vehicle Division has been notified that the SR-22 is no longer in effect, but is still required, Motor Vehicle will suspend your license for that reason alone. If you decide to change insurance companies, you need to get a new SR-22 filed before the old one goes out of effect. Why do I need SR-22? The state of Colorado requires SR-22 is required for many reasons. The most common reason is when a driver has had his/her driving privilege revoked or suspended for a DUI offense, excess point accumulation, driving without liability insurance and for being involved in too many accidents. How long do I need SR-22? As a general rule, SR-22 is required for 3 years except for first DUI revocations with no accident.